If you’re looking for the best New Year’s Eve party in San Diego, look no further. We’re ringing in the new year in style with a night of drinks, dancing, great music, and impeccable views of the The San Diego Bay at it’s finest. Start 2019 on a high note aboard the Hornblower Adventure Yacht. Order your tickets today. 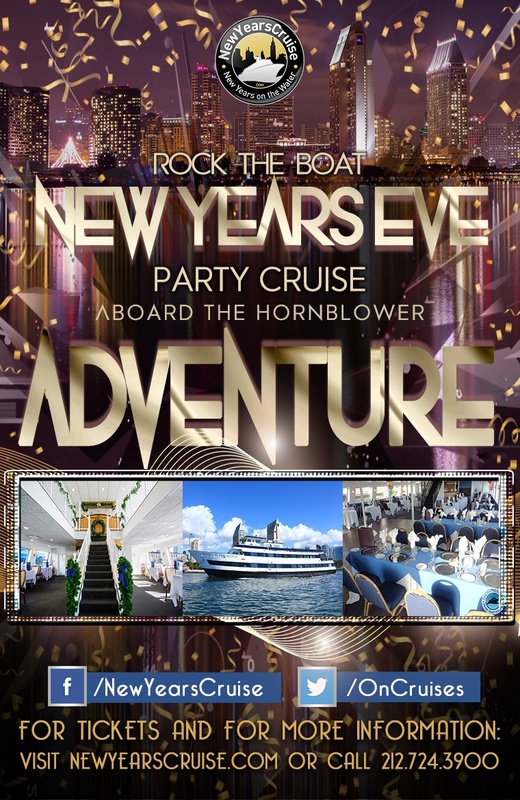 Hurry, you don’t want to miss your chance aboard this exclusive San Diego NYE event. The night of your life is aboard the fantastic Hornblower Adventure Yacht. A stellar vessel that is the premier destination for an end of the year celebration. The interior design is just absolutely lovely, and the ship is very comfortable. This yacht has not one, but two spacious, climate-controlled interior decks. Giving you a great atmosphere to go with your breathtaking views of San Diego Bay. Want some fresh air with those views? Then make your way to the sky deck. We’ve procured the talents of an incredible DJ to make sure this San Diego NYE event has all the right vibes. Move and groove to mix of the hottest in Pop, Hip-Hop, RnB, Electronic, and Top 40 Hits as you sail into 2019. Parched? Allow one of our experienced bartenders cater to your needs. Enjoy four hours of open bar as part of the new year’s cruise experience. While you’re at it, try some of the hors d'oeuvres our servers will be carrying around. We’ve told you everything there is to know about this epic end of the year yacht party. So go, tell your friends, make those plans, maybe even pick out the perfect outfit to end your year, and order those tickets. Hurry, order your tickets before it’s too late. This exclusive San Diego NYE event will be hosting only 400 guests.